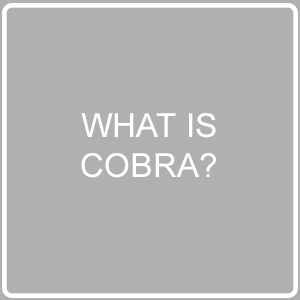 You are here: Home / All Employee Training Posts / COBRA (Employee) / What is COBRA? COBRA stands for the Consolidated Omnibus Budget Reconciliation Act, which became law in 1986. COBRA gives you the right to choose to temporarily keep the group health insurance benefits that you would otherwise lose after you reduce your working hours, quit your job, or lose your job. It also lets family members choose to keep health insurance after your job loss or other qualifying event that would normally cause them to lose the coverage they have through your employer. COBRA applies to nearly all employers with 20 or more employees. Before this law went into effect, when employees left their companies, they and any covered family members lost their health insurance immediately. If the employee or a family member were ill, they were often not able to get new health insurance because they were already sick. COBRA allows an employee to buy health insurance through the employer, even though the person no longer works there or no longer works full time. Voluntary or involuntary termination of the covered employee’s employment for reasons other than gross misconduct. Reduced hours of work for the covered employee. Divorce or legal separation of a covered employee. Death of a covered employee. Loss of status as a dependent child under plan rules. * This 18-month period may be extended for all qualified beneficiaries if certain conditions are met in cases where a qualified beneficiary is determined to be disabled for purposes of COBRA. However, COBRA also provides that continuation coverage may be cut short in certain cases. In the event of a divorce, legal separation, disability, or a child losing dependent status, the member or other covered persons must notify 24HourFlex. In the event of an employees death, termination/separation, reduction in hours, or medicare entitlement, the employer must notify 24HourFlex. In the event that a member changes their martial status or their spouse changes address, they should notify 24HourFlex. Members may be required to pay the entire premium for coverage up to 102% of the cost to the plan. Premiums may be higher for persons exercising the disability provisions of COBRA. Failure to make timely payments may result in loss of coverage.